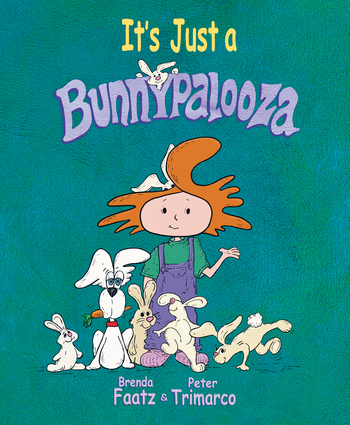 It’s Just a Bunnypalooza for our red-headed protagonist Lizzy. Ever rambunctious and creative, Lizzy is learning new dance moves from her furry bunny friends just in time for the school talent show. When she tells her classmates that she’s learning hip-hoppity moves from bunnies, Lizzy becomes embarrassed and self-conscious as the children giggle at her over-active imagination. From there, Lizzy is decidedly in complete denial that animals communicate with her. She becomes an avid "non-believer.” Naturally, the bunnies organize an intervention. Not only will these furry little creatures not allow Lizzy to attempt ‘hip-hop’ without them, they do not want to lose their friend. Word travels fast and before long, where once there were two bunnies there are now three … and soon four and then dozens more. All the while, Lizzy remains steadfast in her denial right up until the “Rabbit-a-Raucous Recital.”This little tale about Lizzy and ‘cotton-tails’ provides multiple social-emotional-learning moments…and is also pure adventure-in-rhyme, fantastical humor and, as with all Lizzy books, plays with made-up words. For ages 3-7, this is the third book in the award-winning “It’s Just So” series (Foreword Indies Silver, Mom’s Choice Gold, CIPA- Gold, Reader’s Favorite Gold). Brenda Faatz has an undeniable connection with children. Some say it's because they instinctively know "one of their own." A graduate of The University of Northern Colorado with a degree in Musical Theatre, Brenda is a professional singer, dancer and actor. Along with her husband, Peter Trimarco, she wrote the music, lyrics and script for the original Wee Noteables musical theatre live performance series for children. Brenda also founded and currently directs and teaches at the Notable Kids Arts Center in Denver, Colorado where she has the honor of interacting with and learning from children and their families on a daily basis. This is her first children's book because, as she likes to say... "no one ever told me I couldn't. "Peter Trimarco was a fine arts student who graduated from Lake Forest College with a degree in literature and went on to pursue a career as an editorial cartoonist…but drawing 'grownups' stopped being fun. Before being inspired by the opportunity to co-write and illustrate a children's book with Brenda, he journeyed through life as an entertainment industry professional. From art director to executive producer to publisher of an international film magazine he found a good deal of success (awards and working with people who had entourages). But then came working with children and it became fun again. The words began to flow and with it, the paint, the ink and, most important, the orange hair on Lizzy's head. …and three simple words from Brenda put it all in motion" "It's Just So…"Peter Trimarco was a fine arts student who graduated from Lake Forest College with a degree in literature and went on to pursue a career as an editorial cartoonist…but drawing 'grownups' stopped being fun. Before being inspired by the opportunity to co-write and illustrate a children's book with Brenda, he journeyed through life as an entertainment industry professional. From art director to executive producer to publisher of an international film magazine he found a good deal of success (awards and working with people who had entourages). But then came working with children and it became fun again. The words began to flow and with it, the paint, the ink and, most important, the orange hair on Lizzy's head. …and three simple words from Brenda put it all in motion" "It's Just So…"